I have a problem of comparing myself to people, constantly trying to place myself on some sort of spectrum that defines my worth against others. I’m just trying to find my place amongst everyone else, but it ends up being detrimental to my emotional well being. I sit on the bus and go- I’m fatter than she is but definitely in better shape than that other girl; I have a nicer face than her but soandso has nicer skin; she is really sociable, but I’m funnier and so on and so on. 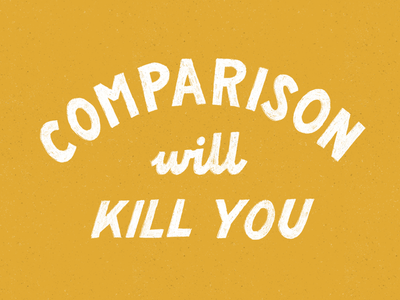 I could compare myself to others forever. What’s the point though? It doesn’t help me to feel like I’m better than other people, all it does is give me an unrealistic image of myself. Over and over again. Then why do we do it constantly?